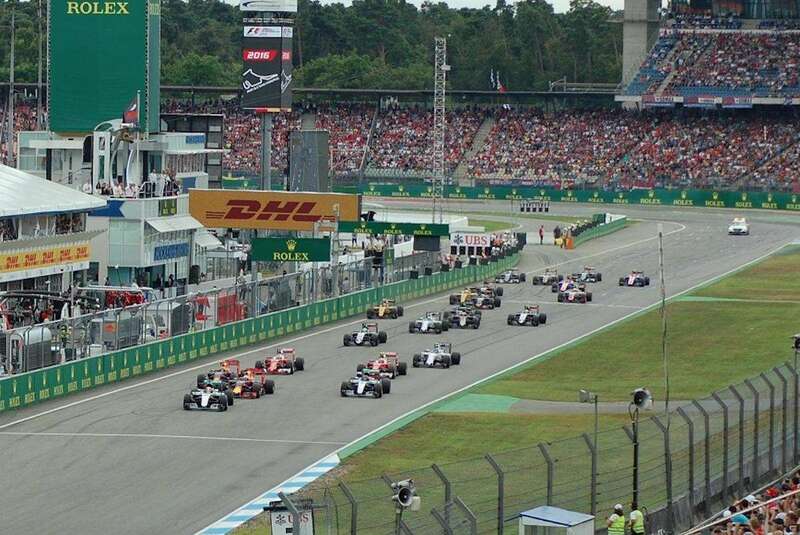 The German GP returns to the F1 calendar next year at the Hockenheimring on July 20-22. Svenja Reber went to the last race in 2016 and gives us her tips on getting the most out of the weekend. I live close to the Hockenheimring, so I never miss the German Grand Prix when it is held there. I don’t need accommodation, as I can drive home easily each day. The traffic can get really congested near the circuit, so I always park at the train station in one of the neighboring towns and take the train for the last couple of stops to Hockenheim. 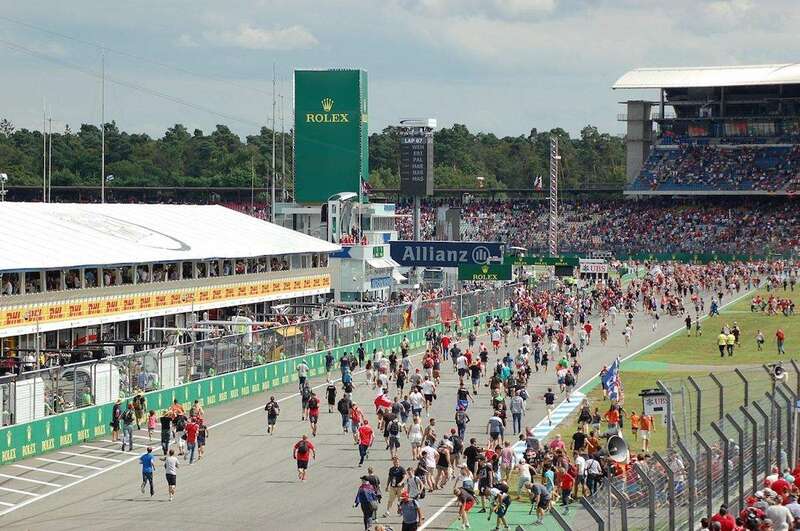 There are shuttle buses from the Hockenheim train station to the track, which run regularly from Friday morning until Sunday evening and are free for ticket owners. From the bus stop at the entrance, you only have to walk a few minutes to get to the grandstands. I’ve sat in almost all the grandstands at the Hockenheimring. The best grandstands in my opinion are the Nordtribüne B and C and the Innentribüne B and C. The Nordtribüne B and C are on the first corner; you can see the start, plus all of the pitlane. The Innentribüne B and C are on the Sachs curve in the middle of the circuit. I was there with friends for the last German Grand Prix at the Hockenheimring. Our weekend began on Thursday with the pitlane walk for fans. The entrance to the pit lane walk is from near the Südtribüne (to the right of the main grandstand). On Friday, everyone with a weekend ticket was allowed to try out other grandstands (Free Friday), which was great, except not all of them were open! We watched FP1 from the Nordtribüne B, for which we had tickets and FP2 from the Innentribüne C. From Saturday onwards, you can only enter the grandstand for which you have tickets. So we saw the third free practice and the qualifying in our places on the Nordtribüne B. After qualifying, there is an autograph session with all the Formula 1 drivers in the F1 Fan Village, which is behind the grandstands Haupttribüne and Südtribüne. However, it is not easy to get autographs from the drivers, there’s just too many fans! Some fans don’t even watch the qualifying; they are waiting from midday next to the barriers in front of the stage where the drivers appear. The drivers always give these waiting fans autographs, or you can join a queue, but you never know whose autograph you will get. I was lucky last time and got lots of autographs! On Sunday we watched the race in our Nordtribüne B seats. We took the train as always and had no issues with traffic or parking. Taking the train is definitely the best way to get to the circuit, even if the shuttle buses from the Hockenheim train station are sometimes overcrowded. I recommend staying in neighboring cities like Mannheim, Heidelberg or Karlsruhe, which are easily reached by train. You will also find plenty of accommodation in these towns. 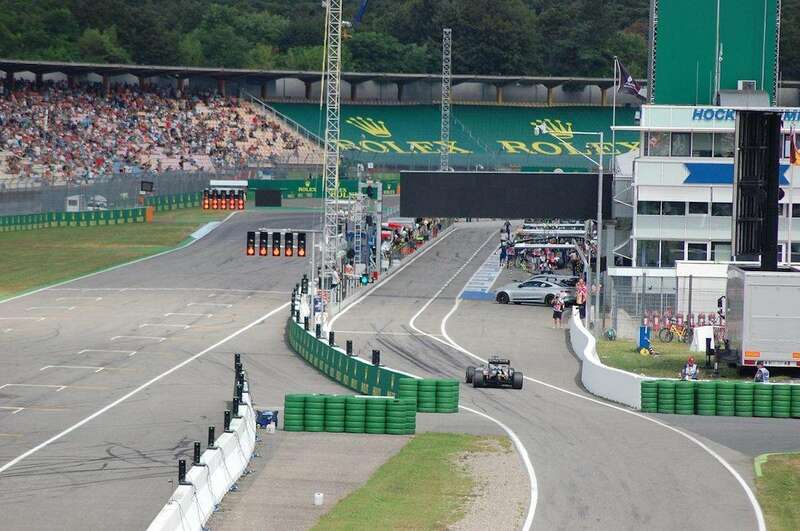 The Hockenheimring is a good Formula 1 venue. It’s easy to reach, especially by train, and the ticket prices are not too high. For example on the Innentribüne, tickets for the whole weekend cost only €99. However, these seats are right down the front and you have a view of the safety fence. The race is really well organized and the F1 Fan Village has a good atmosphere with plenty of choices for eating and drinking. You can also take your own food and drinks to the grandstands. Click here to buy tickets to the 2018 German Grand Prix on July 20-22. 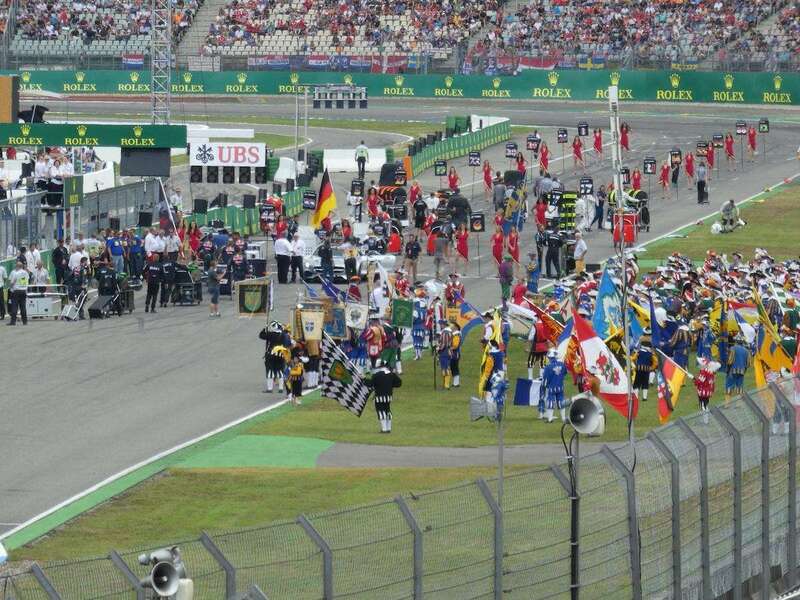 Have you been to the Hockenheimring? Leave a comment and tell us about your experience! Hello, would you happen to know if the hockenheim GP usually has live entertainment like concerts in the after hours after racing throughout the weekend? Bahrain for example has top performers two nights as well as a party tent. Not really. There may be a small stage in the F1 Fanzone (and in the campsites), but don’t expect any big name artists. Do you know if train tickets from neighbour cities have to be reserved before the they of the race? I will go from Mannheim to Hockenheim by train on sunday, I’m afraid to arrive to the train station and not having tickets.